When it comes to florals, I’m super fussy. Of all prints, flowers are my very favourite, but there are so few florals that pass my ridiculous self-imposed standards that I seldom end up sewing with them. For me, florals can’t be too tiny, too ornate or too literal. They can’t be too muted, or too overly cartoonish. I’ll only do one solid background colour (preferably black or dark navy) and not too many colours on the flowers, especially if those blooms are on the small side. Sheesh. It’s a wonder I ever buy any fabric at all. Needless to say, when I spot my perfect floral I’ll go to all sorts of ridiculous lengths to make it mine. Take this one for instance. It has a long and complicated back story, as so many great love stories do. I fell in love big time with this big, sparkly, silvery floral jacquard-y cloth fabric way back in 2014, when I spotted it online in a Karen Walker collection (in a dress, a top and pants). I saved the photos, I pinned them, I dreamed of those big, slightly pixelated flowers, but I never expected to find the fabric on a roll, available by the metre. And then, a couple of years later, there it was on Instagram. Sparkling away in this little picture, in the shape of a bomber jacket. The Fabric. It would be mine. 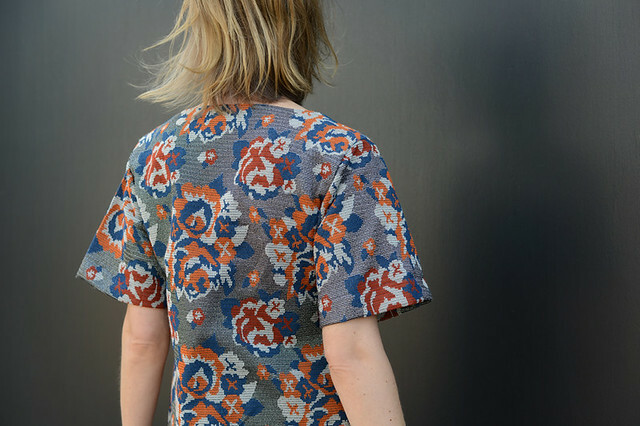 After harassing the Instagrammer (the very talented Kate) I tracked down the seller, Drapers Fabric, in Auckland, who didn’t at that stage sell online. I ordered the quaint, old fashioned way – in an email, with a credit card. Two metres of dream floral, headed across the seas. It felt like a major achievement. When it arrived there was no disappointment – it’s gorgeous. Thick, heavy (SO heavy! ), structured and sparklier than photos show – a sewing buddy described it as ‘glamorous chainmail’, which is very fitting. Of course I had no idea what I wanted to do with it. Bomber? Full midi skirt? 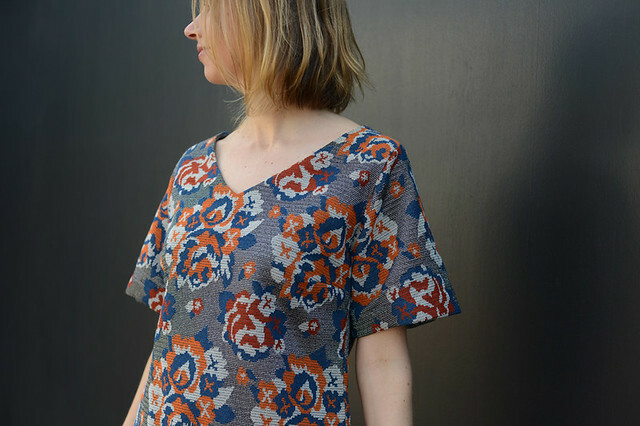 Short shift dress? Top and skirt? All of the above…? So it sat in the stash for a year. The dream fabric, just gathering dust. Luckily, I recently had a reason to pull it out. A friend who is a big ‘celebrator’ announced he was having a milestone birthday party in September and it was gonna be huge. I resolved to wear the floral fabric on the night, figuring the rest of the details would come to me in time. So while preparing for a mid-year craft camp I threw the glam chainmail in my project box, along with some Japanese pattern books, and hoped for the best. Once I actually sat down with the fabric, I realised it wouldn’t be so straightforward. This cloth has no drape, and it’s so thick that any tucks, pleats, gathers or details would just look hopelessly bulky. I needed simple, straight lines, with no fuss. I got tracing, cutting and sticking, taking bits and pieces from a few different patterns. 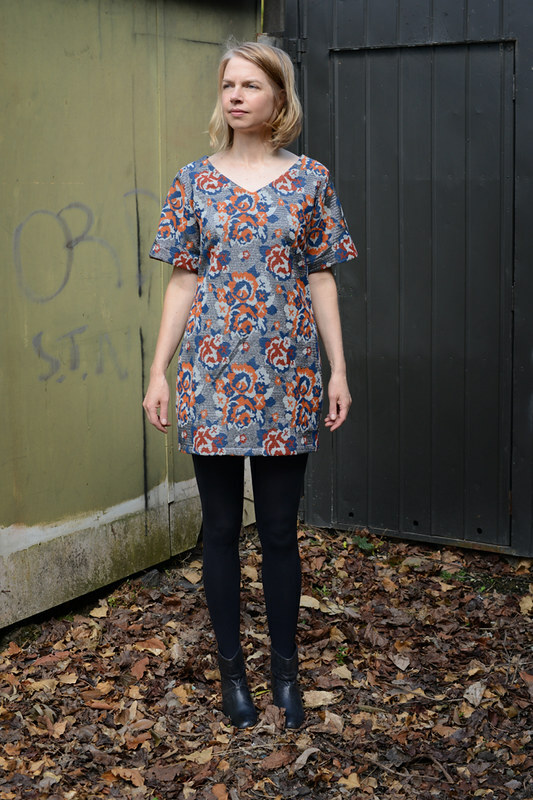 The v-neckline’s from one Japanese sewing book, the basic shape was traced from one of the shift dresses in Stylish Dress Book 2, the darts are traced direct from the Deer and Doe Melilot shirt and the sleeves are all mine – traced from another dress and trumpeted a little by yours truly. 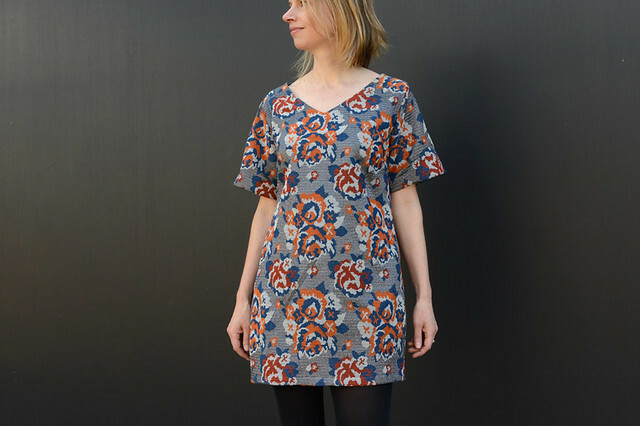 When I look at the final dress I wonder why the hell I didn’t just use a pattern from the start – the Named Inari Tee Dress, the Pattern Fantastique Aeolian or perhaps the Style Arc Adeline….? It would no doubt have ensured a much better fit and finish, and would have saved me so much chopping, unpicking and starting again – I literally took the sides in half an hour before I left for the aforementioned milestone event after my mister told me it looked a little tent-like. Sometimes I make things so difficult for myself. In the end, none of it mattered come party time. This dress was so fun to wear, dance in and drink too much champagne in – there’s something really satisfying about making an ‘occasion’ outfit, even if you doubt you’ll get much wear from it. I aired it and hung it up the next day, unsure when we’d meet again. But of course, this is a blog, and blogs require photos. So a few weeks later there I was, recreating an early Sunday morning walk of shame in my party frock, hair a mess, awkwardly posing for pics as if it’s totally normal to wear tights and sparkles down some random local laneway while people head out for dog walks and brunch dates. The things we do. Embarrassing as it was, being in the dress again reminded me of how much I love the print, and I vowed to try to wear it as much as I can, occasion or not. 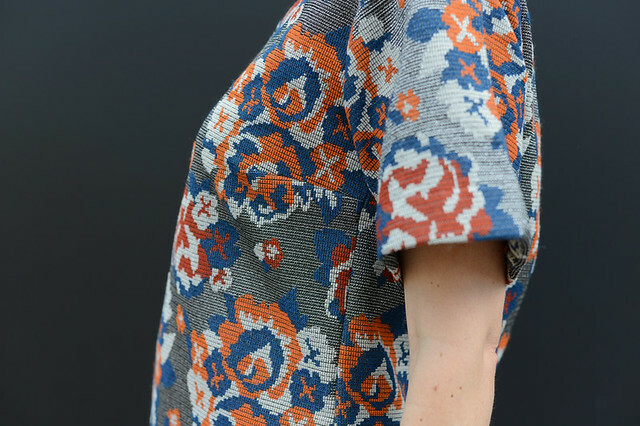 In the meantime, I’ve fallen in love with a new designer floral – just a bit of Marni, nothing fancy. If anyone spots a roll of it, please let me know. I love a happy ending… and this dress is one such example. Although the mash-up gave you grief, the end result is fabulous. 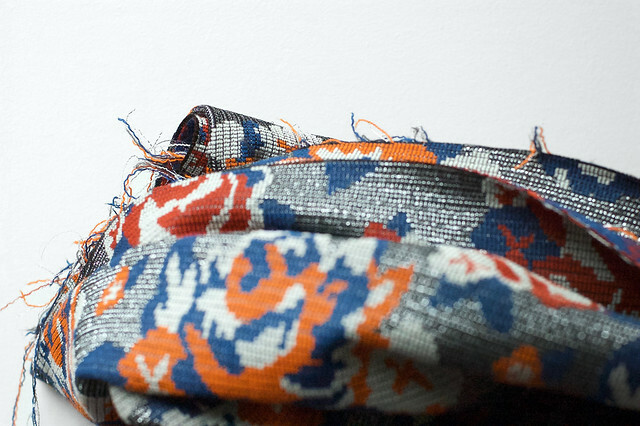 And that fabric… lush worthy stuff! That fabric is saga worthy. I am with you 100% on this. Love the dress you came up with! & no one else will EVER have the same dress. Total success.